Radio România Internaţional/ Contest / Winners of the prize-winning contest “Govora:Spa tourism at European level"
Dear friends, Radio Romania International invited you to participate, until February 28, 2019, mailing date, in a prize-winning contest entitled “Govora: Spa tourism at European level”, devoted to Baile Govora spa resort, to spa tourism as well as to the international meetings the resort is hosting during Romania’s presidency of the Council of the European Union. The contest proved quite popular with our listeners, receiving 225 correct and complete answers. Thank you for participating and we invite you back in the upcoming editions. The Grand Prizes consist in two full board, 8-night trips for one person, between June 15 and 30, 2019, sponsored by the Palace Hotel in Baile Govora spa resort, in Valcea County. The contest was organized jointly with the Valcea County Council, the City Hall of Govora, the Valcea branch of the Fine Artists Union, the Archbishopric of Ramnic and the Valcea branch of the SALROM National Salt Society. Question: Where is Romania’s largest balneal park located? 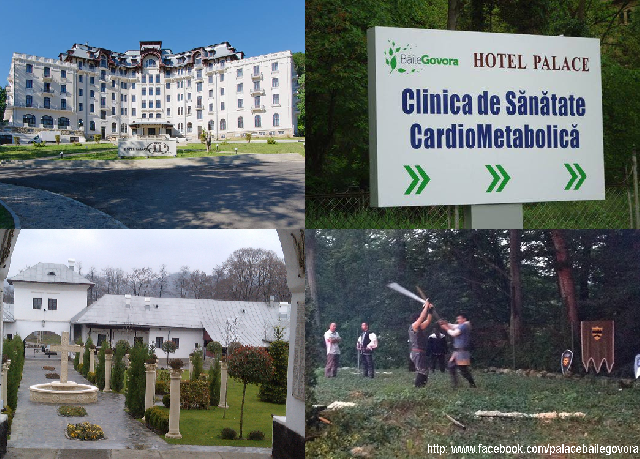 Q: In which county of Romania is Baile Govora spa resort located? Of the 10 honourable mentions went to: Biswanath Bhatta, Prithwiraj Purkayastha, Samir Mukhopadhyay, Mitul Kansal şi Shatrudhan Sharma, all five from India, Ralph Sorrentino and Carrie Hopper, both from the US, Ziyad Salem Aqil from Jordan, José Luis Corcuera of Spain and Michel Frémy, from Belgium. The 10 3rd prizes awarded, went to the following listeners and Internet users: Wade Martyn and Richard Contone, both from the US, Obaid Alam, from Pakistan, Chaitaly Sarkar, from India, Zoran Vrucinici, of Bosnia and Herţegovina, Dilmi Tahar, of Algeria, Anatolii Klepov, of Russia, Miguel Ramón Bauset, of Spain, Joaquín Bustos Baptista, of Venezula, and Maguy Roy, from France. The 10 2nd prizes went to: Dylan O’Dwyer, from Ireland, Emin Omerspahici, from Bosnia and Herţegovina, Olexandr Kuziominskiy, of Ukraine, Liu Fajian, of China, Anna Mahjar-Barducci, of Italy, Abdelilah Izou, from Morocco, Georg Pleschberger, of Austria, Nikolai Larin, of Russia, Javier Núñez Mon, of Spain, and Mériem Sabine Amrane, from Algeria. The 10 1st prizes went to: Grant Skinner, from the UK, Angelina Olaru, from the Republic of Moldova, Serhii Badik, of Ukraine, Chen Wei, of the US, Francesco Paroli, of Italy, Boudoukha Mohamed, of Algeria, Carsten Fenske, of Germany, Iurii Gavrilov, of Tadjikistan, Álvaro Muñoz Yáñez, of Chile, and Amady Faye, from Senegal. 6 special prizes went to the following listeners and Internet users: Christer Brunstrom, of Sweden, Ali Benchohra, of Algeria, Dieter Langguth, of Germany, Andrei Bondarenko, of Russia, Christian Ghibaudo, of France, and Antonio Avelino da Silva, of Brazil. And now, the winner of the grand prize: his name is Hans Verner Lollike, from Denmark. He won a full board, 8-night trips for two persons, between June 15 and 30, 2019, at the Palace Hotel in Baile Govora spa resort, in Valcea County. Congratulations! We thank all our listeners who participated in the contest. The prizes will be sent to the winners by mail, in the upcoming months. Please confirm their receival by post or email. Thank you again! We are looking forward to your participation in our next contests.